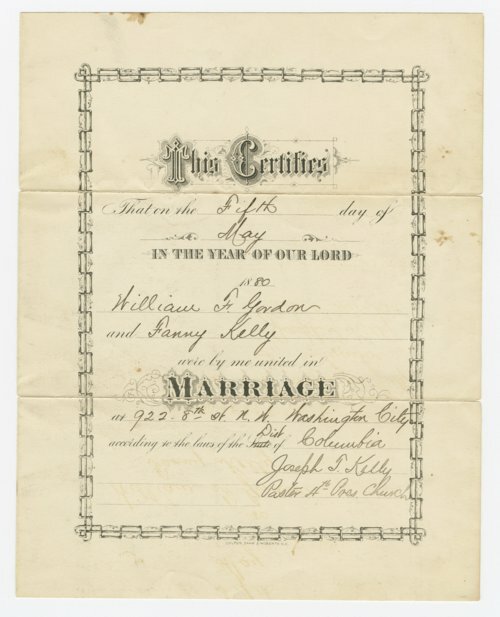 This is a marriage certificate issued to William F. Gordon and Fanny Kelly. In 1864, she and Josiah Kelly, her first husband, were traveling from Kansas to Idaho when they encountered a band of Sioux. She was captured and several members of their party were killed. Josiah was able to escape. After nine months as a captive, she escaped. Fanny and Josiah returned to Kansas and started a hotel in Ellsworth. In 1867, Josiah contracted cholera and died. Later, she married William F. Gordon and lived in Washington, D.C. until her death on November 15, 1904.